Email accessibility is the most discussed topic at all digital and email marketing summits. Most of us have never thought of those who cannot hear and see. Do you know that 4.5 % of your subscribers have special needs? And they want to be able to read your emails, too! To show care about your clients. Just imagine: 285 million people worldwide have visual impairments even when wearing glasses. This makes more than half of the EU population or 87% of the USA population. And 5% worldwide (over 360 million) have hearing impairments. In this post, we’re gonna reveal email accessibility best practices and ways of implementing them by using email templates provided by the best email editors. What is accessibility in email marketing and how to make your emails accessible? Blindness and other visual impairments require using screen reading programs like VoiceOver (Mac), Microsoft Narrator (Windows), TalkBack (Android), etc. 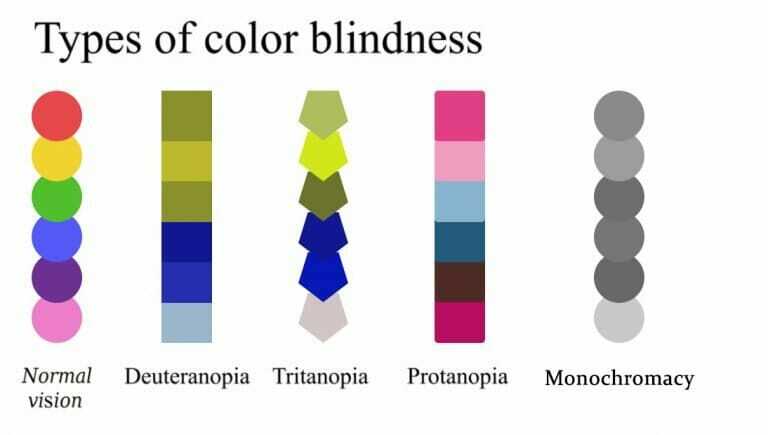 As for color blindness — there are people who don’t distinguish red and green (protanopia) or even cannot differentiate colors at all, only the shades of gray (monochromacy). So how can we improve emails accessibility? Let’s take a look at email accessibility standards and some practices to code emails of this type. This is a set of rules and standards to compose emails that will be easy-to-read for people who suffer from visual or hearing impairments. There are a few types of color blindness. Protanopia is a reduced sensitivity to red and its shades. Red-blind people often confuse black and many shades of red, dark/light brown and dark/light green (respectively) and shades of blue and red. Deuteranopia is a reduced sensitivity to green. Green-blind people also tend to confuse mid red and green, bright green and bright yellow, light blue and lilac. Tritanopia is characterized by an inaccurate perception of blue. People who suffer from tritanopia confuse light blue and grey, dark purple and black. Monochromacy is a complete color blindness. Sufferers see only shades of grey from black to white. ➢ if you use interactive elements (like rollovers) to run quizzes in emails and decide to highlight correct answers with green and incorrect with red — be sure to indicate if the answer is correct with words also. It’s crucial to use this tool, which is totally free btw, to see the emails through the colorblind people’s eyes. The situation with total color blindness is absolutely different as blind people use screen readers. We need to create emails that are legible for these assets. A subject line is the first thing a screen reader reads. Make it as concise and descriptive as possible — in fact, it reflects the main idea of the email. Try to listen to some messages by means of any screen reader (I tried 3 ones). It was pretty stressful. How it works: the screen reader speaks the language a blind person has set as a default one. 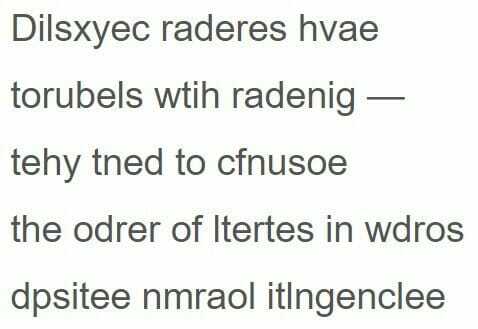 And if this person receives a message that is written in another language, the software reads everything in a horrible way (transliteration). To make sure your emails will be read correctly, in its code set the language you write your email in. (This email accessibility practice works best for bi-or multilingual countries). The Content-Type determines the way an email will be displayed on recipients’ screens. Add <charset=”UTF-8″> in HTML code right after “<head>” as this is the most popular charset, it supports most of the characters. Some modern email builders like Stripo already have set this Content Type in their email templates. When designing and styling text, use tags <h1>, <h2>, etc. as they have an advantage over <p> for a screen reader. Even if your font size is 32px or more, the copy wrapped in tags <h1> or <h2> will be read first. Screen readers cannot “read” images in emails. But they are capable of reading their “alt text”. So make it clear and informative. Note: do not use the word “image” in the alt text, as its tags already contain it. A blind person when listening to this email will hear the word “image” twice. 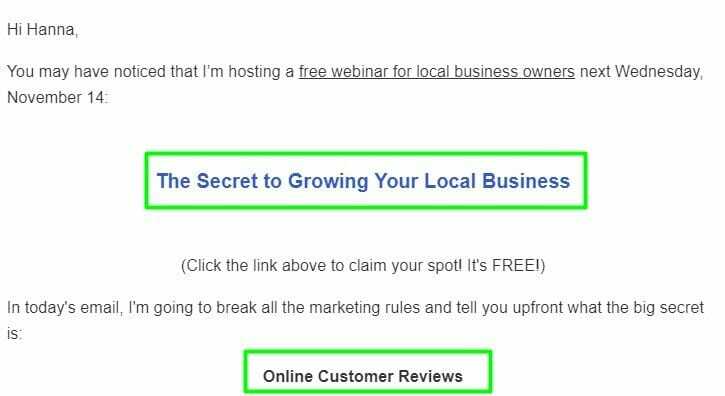 Note: when adding a GIF that shows recipients how to use your product, provide them with a detailed textual manual under the GIF or at least add a link that will take customers to your website landing page. Links are supposed to be meaningful. Make the links text clear and informative! The first link doesn’t contain any specific information, while the second one has details in it. ➢ Android TalkBack doesn’t read links but says “Link — tap twice to open it”. The main mission of email marketing is selling. And CTA buttons are very supportive. Some designers try their hardest to make the button design bright and noticeable. Therefore, email accessibility best practices show that engaging text is more valuable. Most recipients see the button the way you designed it, but a screen reader sees only the copy of the button. Recipients who suffer for blindness do not see the icons. Take care about the alt text for them, too. Dyslexic readers have troubles with reading — they tend to confuse the order of letters in words despite normal intelligence. How can we improve email accessibility? British Dyslexia Association offers a detailed guideline on how to create websites, blog posts and books. ➢ end all sentences with a period (.) and end bullet points with full stops or semicolons. There is only one email accessibility requirement: under the videos where you explain how to use/install your product with voice, add captions or subtitles. And never rely on Youtube subtitles as they sometimes mishear words. (For fun, try to listen to your fav TC show with subtitles on). ➢ apply only left alignment to text in emails. And, of course, make your emails with love and care for everyone. Stick to all these email accessibility guidelines — and you will succeed to create beautiful emails all your clients will be able to read!